“They sure did,” said Calvin. “I see them walking this way,” said Calvin. Sure enough, Cameron Cauliflower, Olive Onion and Oliver Onion walked into the barn. “Here is some more new material,” said Oliver, handing Christopher a stack of hand-written pages. Calvin Carnot got behind his set of drums while Mrs. Tomato and Olive got behind their microphones. Cameron Cauliflower came bounding on stage, trying out his new dance routine. Cameron danced and Christopher started singing their opening number. All of a sudden, Olive burst into tears. “Well I am sweet corn,” said Christopher. 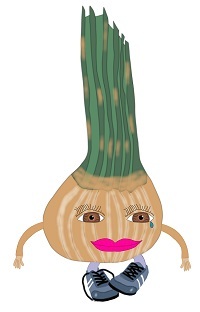 Example: Olive Onion cried when she heard Christopher Corn sing because he had such a sweet voice. This entry was posted in Fresh Veggie Family Stories, Grade 4 Level, Summer Stories, Summer Story Challenge 2017 and tagged barn, can't stop crying, Christopher Corn, concert, dance, Olive Onion, Olive Onion Can't Stop Crying, song, sweet corn. Bookmark the permalink.